Anyone who has ever set foot into the classroom of Dr. Michael Kroff knows just how excited he is about marketing. The unpredictable nature of the decision making process with all of its rational and emotional components is what draws Kroff to the people side of business. Halie Hagerty, a senior chemistry education major with minors in photography and physics education at Southern Utah University, has been volunteering for the last two years with the SUU Honors You program. The program invites kids from low income families to SUU’s campus to learn about the importance of higher education and ways to pay for it. Solutions for Higher Education engages in deeper reflection of critical issues in the world of colleges and universities. In Episode 1, President Scott L. Wyatt and Professor Steve Meredith talk about what most consumers take for granted: college and university ratings. Southern Utah University’s School of Business is being featured on Newsweek. The organization is highlighting the entire School of Business experience, including faculty, students, experiential education, international opportunities and accreditation. As a microbiology professor, Dr. Roger Gold trains his students to become researchers. He is involved in various initiatives at Southern Utah University, all to enhance student learning and strengthen his biology curriculum. With Halloween coming up, Southern Utah University’s Center for Diversity and Inclusion has launched “My Culture is not a Costume” campaign. 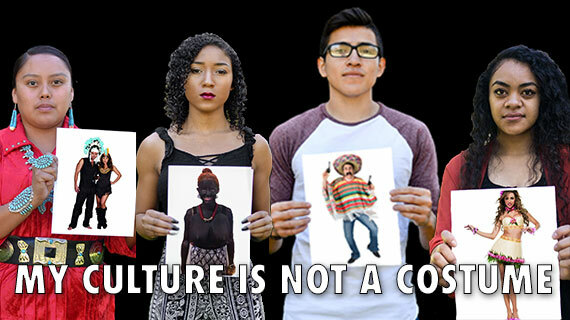 The campaign includes a series of SUU students holding photos of different racial and ethnic outfits in order to raise awareness of culturally insensitive costumes. On Friday, the images were posted online and around SUU’s campus. A woman of exceptional gifts and talents, Germaine de Stael was one of the most remarkable women of letters in her own or any time. She wrote novels, plays, poetry, history, literary criticism, moral and political essays, and autobiographical memoirs. Marya Sklodovski was born into an impoverished intellectual family in Warsaw, Poland. She excelled in physics and mathematics at the Gymnasium and was awarded a gold medal upon her graduation at age 16. In 1891, she enrolled at the Sorbonne in Paris under the name Marie Sklodovska. An understanding of technology can open many doors. Katrina Mehring’s proficiency with technology opened a big door for her, as the computer science major from Pioche, Nevada, was able to secure an internship at Amazon this summer. Southern Utah University re-claimed the title of 2017-18 National Outdoor Champions. After four weeks of the Mother Nature meets March Madness-style competition, Outdoor Nation officially announced SUU as The Most Outdoorsy School in the Nation. With passions ranging from outdoor adventuring to Japanese anime to culinary creations, Abigail Wyatt has shared her talents across the Southern Utah University campus. As a Spanish major and strategic communications minor, Wyatt utilized her vast marketing and event planning experience to strategize, coordinate and execute the Outdoor Nation Campus Challenge at SUU this semester. Galileo Galilei, Italian mathematician, astronomer, and physicist, is responsible for several important contributions to modern scientific thought. When, in the autumn of 1609, Galileo directed his 20-powered telescope at the moon, he became the first man to use the new instrument to study the skies. Professor Jacob Manning started college as a pre-med major. He considered architecture, but quickly settled on recreation leadership and earned a master's degree from Oklahoma State University in 2012. Southern Utah University’s Graduate & Online School is pleased to announce the opening of a new instructional video studio, allowing faculty to enhance their courses with professional quality videos. Studio97 is offering an Open House this Friday, October 13, 2017, from 11:00 am – 3:00 pm. The Open House will be held in the Hunter Conference Center, room 103M, and will offer studio tours, the opportunity for faculty to create sample videos, and light refreshments. The Department of Computer Science and Information Systems (CSIS) provides rigorous accredited (ABET) programs that enable students to pursue graduate studies and/or careers in computer science and information systems. Graduates are in demand by companies both local and nationwide. This fall, Southern Utah University welcomed the largest number of incoming students to campus with 1,948 new first-time undergraduate students. The overall enrollment at SUU has increased by 5.73 percent compared to fall 2016. According to the Utah System of Higher Education (USHE) annual enrollment report released this morning, Southern Utah University continues to grow at a steady rate. The third annual STEAM Festival will be held October 16-17 on the Southern Utah University campus. The two-day festival presents hands-on science, technology, engineering, art and math learning for children of all ages. Southern Utah University is the first university in the state of Utah to create a Masters of Interdisciplinary Studies program. Leonardo was the foremost genius of the Italian Renaissance, and perhaps the most versatile genius that ever lived. He explored all the fields of human knowledge that were available in his time, inserting his superb intellect into every realm where graphic representation is used - including painting, sculpture, architecture, and engineering. One of the greatest figures in the history of thought, Aristotle, more than any other person, determined the direction and form of Western intellectual history. Driven by a desire for knowledge, he mastered every field of learning known to the Greeks, including physics, chemistry, biology, zoology and botany; psychology, political theory and ethics; logic and metaphysics; history, literary theory and rhetoric. He invented the science of logic and biology. Mykayla Gale found her passion for elementary education during high school. She was a teacher’s assistant for the Extended Day Kindergarten class, an after-school program to help children who fall behind in school and prepare them to be successful in future years. Most commonly thought of as a philosopher, logician, and political economist, John Stuart Mill is one of the major intellectual figures of the 19th century, and is one of the most enduring and indispensable writers of his time. As the world becomes more connected through technology, the threats to our security grow even more numerous. Standing at the gate to defend against cyber attacks are people like Landon Beach, a senior from Springville, Utah who is majoring in computer science at Southern Utah University. As college students, it can be difficult to remember to explore the great outdoors as a refreshing weekend activity. Staying near campus all the time means running the risk of getting cabin fever and feeling weighed down by schoolwork and studying. So why not muster up the courage and ask out that girl you’ve been admiring in your Chemistry class?